Listen to our livestream every Sunday. John 6:44-No man can come to me, except the Father which hath sent me draw him: and I will raise him up at the last day. I’ve often thought about the great drawing power God has. When He spoke to Adam and Eve He drew them out of hiding. When He spoke to Moses through the burning bush He drew him out to be a leader. When He called the disciples He drew them out to follow Him. God continues to draw humanity today through the Holy Spirit. When God spoke to me through the preached Word of God and the Holy Spirit, I was drawn to the altar. John 6:44 was a reality in my life at that very moment God drew me. He saved my soul and gave me eternal life! Thankfully, He still draws His children to Himself even after we are saved. Through His love, His correction, and His mercy, God keeps us to Himself by continually drawing us who are saved. During this time of spring revival and Easter, I’m praying that you feel God drawing you to Himself. If you don’t know Jesus as savior, I pray God convicts you, draws you to an altar of repentance, and saves your soul. For us who have been saved, I pray we would allow God to draw us closer to Him. Come learn more about Jesus and how we can serve him in our daily lives. Do you want to know more about our weekly youth programs for all ages each Wednesday night starting at 5:30 with a free meal? 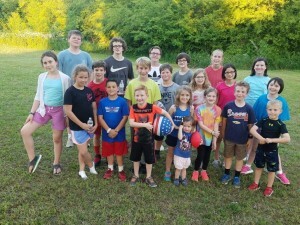 How about a summertime weekend trip to church camp or the fun and games at Vacation Bible School plus many other youth activities hosted by our Youth Group? Wednesday Morning Bible Study—10 a.m.
Our Worship Service is broadcast on 104.3 FM on the 1st and 3rd Sundays at 9:00 am. Our Sunday School Service is broadcast live on 104.3 FM every Sunday at 10:30 am. 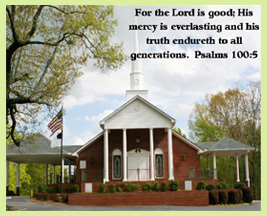 For the Lord is good; His mercy is everlasting and his truth endureth to all generations.